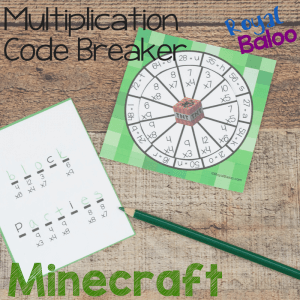 It’s time for more Minecraft multiplication printables! 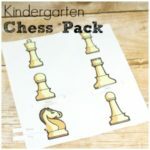 We all want our kids to enjoy school work, right? But sometimes it’s not 100% possible. We all will be faced with something in life that we don’t really want to do but it ultiamtely good for us. So I just do my best to make it entertaining or fun. Minecraft has become quite an important part of our work as my kids are very motivated by anything Minecraft. I promised Baloo (now 11) Minecraft puns if he did some Minecraft and he was all ears. The code breaker comes in two parts – the smaller circle (with the TNT) and the larger square (with the green border). Line up the smaller circle in the middle of the bigger one. Poke a brad through the middle so the code breaker can spin freely. And voila, you have a Minecraft Code Breaker! The code breaker comes with 4 ‘punny’ cards. On one side is a pun/riddle/joke and the other side contains the answer – in code form. 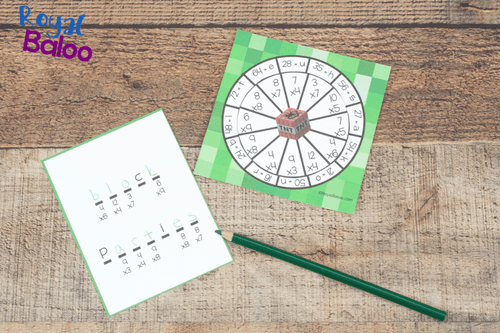 Use the code breaker to break the code and find the answers to the puns! Find the math problem under the letter. 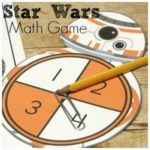 On the code breaker, find the matching multiplication problem. Line it up with the correct product. Write the letter next to the product on the line of the pun! But there are many other ways to use the code breaker too – we don’t just stop at breaking the codes! 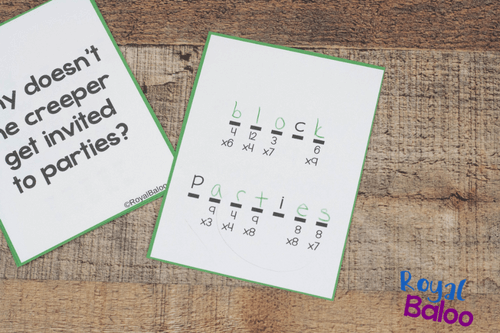 After finishing these puns, kids can use the code breaker to make their own codes! The breaker only includes 12 letters but the rest of the alphabet can be filled in with regular letters instead of code! 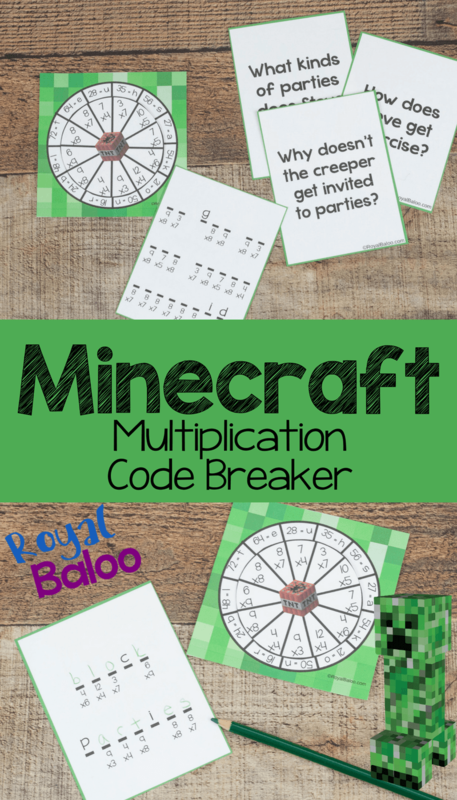 Once you’ve made your code, give the code and the codebreaker to a friend to solve!